Georgia is a state located in the Southern United States. According to the 2010 United States Census, Georgia is the 9th most populous state with 9,688,681 inhabitants and the 21st largest by land area spanning 57,513.49 square miles (148,959.3 km2) of land. Georgia is divided into 159 counties and contains 535 incorporated municipalities consisting of cities, towns, consolidated city-counties, and consolidated cities. There is no legal difference in Georgia between cities and towns. Eight municipalities have merged with their counties to form consolidated city-counties: Athens with Clarke County, Augusta with Richmond County, Columbus with Muscogee County, Cusseta with Chattahoochee County, Georgetown with Quitman County, Macon with Bibb County, Statenville with Echols County, and Webster County unified government with Webster County. Athens and Augusta also have municipalities independent of the consolidated governments and are considered consolidated cities. 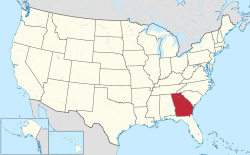 ^ The city of Payne was abolished on March 27, 2015 by the Georgia General Assembly. ^ Population and area refer to the balance of the Athens-Clarke County unified government which does not include independent town of Bogart which is partially in Clarke County and the city of Winterville which is entirely located within Clarke County. ^ Population and area refer to the balance of the Augusta-Richmond County unified government which does not include independent city of Blythe which is partially in Richmond County and the city of Hephzibah which is entirely located within Richmond County. ^ City of Brookhaven officially incorporated December 17, 2012 and is thus not represented in the 2010 or 2000 census, but population estimate is given. ^ The city incorporated 2007. ^ Some of the population change can be accounted for by the annexation of Bibb City. ^ City of Johns Creek officially incorporated December 1, 2006. ^ Macon merged with Bibb County January 1, 2014 and is thus the population shown is based on that of Bibb County at the year in question. ^ City of Peachtree Corners officially incorporated July 1, 2012 and is thus not represented in the 2010 or 2000 census, but population estimate is given. ^ a b c d e f g h i j "GCT-PH1 – Population, Housing Units, Area, and Density: 2010 – State — Place and (in selected states) County Subdivision". 2010 United States Census. United States Census Bureau. Retrieved August 8, 2016. ^ a b c "Georgia: 2010 Population and Housing Unit Counts 2010 Census of Population and Housing" (PDF). 2010 United States Census. United States Census Bureau. September 2012. p. III-2. Retrieved August 8, 2016. ^ Perry Hiott & Chris Dobbs, Georgia's City Governments, New Georgia Encyclopedia (last updated November 12, 2015). ^ "HB 575 2015-2016 Regular Session". www.legis.ga.gov. ^ "2000-2010 Entity Changes" (txt). 2010 United States Census. United States Census Bureau. Retrieved June 17, 2016. ^ "Macon-Bibb County consolidation wins with strong majorities". The Macon Telegraph. 2012-07-31. Retrieved 2012-08-01. ^ "Peachtree Corners city Georgia QuickFacts from the US Census Bureau".